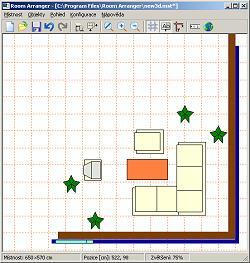 To create the rooms use Room Arranger software, which can be freely downloaded here. (New versions are shareware, the older ones until v. 3.26 are freeware; You can find the link to this program on our download page for members - and we update it there when necessary). Install the software and then run it. Then you can use the button beside the first mentioned - to add more objects to your room. Choose the right library (bathroom, living room, kitchen) and then doubleclick to the item you want (for example a desk). It will be placed to your room and you can drag it to the right position. You can click to it by the right button of your mouse to set some features of the objects - it's size, exact position, color etc. Room Arranger can show your room in 3D via a VRML browser. If you haven't installed the VRML plug-in to your internet browser yet, just do it. We use a Cortona plug-in for MS Internet Explorer from Parallel Graphics (you can download it here ; You can find the link to this program on our link page for members - and we update it there when necessary). 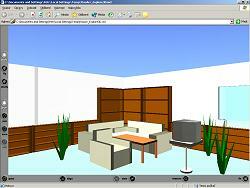 To see the 3D picture, just press the button with an image of Earth in Room Arranger. The picture you've created you can get by the Print Screen button on your keyboard - then use your favorite graphic editor to save it. And now create the anaglyph picture - in 3DJournal software.